A benign tumor does not contain cancer cells and usually, once removed, does not recur. Most benign brain tumors have clear borders, meaning they do not invade surrounding tissue. However, these tumors can cause symptoms similar to cancerous tumors because of their size and location in the brain. Metastatic brain tumors are tumors that begin to grow in another part of the body, then spread to the brain through the bloodstream. Common types of cancer that can travel to the brain include lung cancer, breast cancer, melanoma (a type of skin cancer), and colon cancer. All of these cancers are considered malignant once they have spread to the brain. More than 18,820 people in the US will be diagnosed with malignant tumors of the brain or spinal cord during 2006. Cancer of the brain or spinal cord account for approximately 1.3 percent of all cancers and 2.2 percent of all cancer-related deaths. Patients with certain genetic conditions (i.e., neurofibromatosis, von Hippel-Lindau disease, Li-Fraumeni syndrome, and retinoblastoma) also have an increased risk to develop tumors of the central nervous system. There have also been some reports of people in the same family developing brain tumors who do not have any of these genetic syndromes. Research has been investigating parents of children with brain tumors and their past exposure to certain chemicals. Some chemicals may change the structure of a gene that protects the body from diseases and cancer. Workers in oil refining, rubber manufacturing, and chemists have a higher incidence of certain types of tumors. Which, if any, chemical toxin is related to this increase in tumors is unknown at this time. 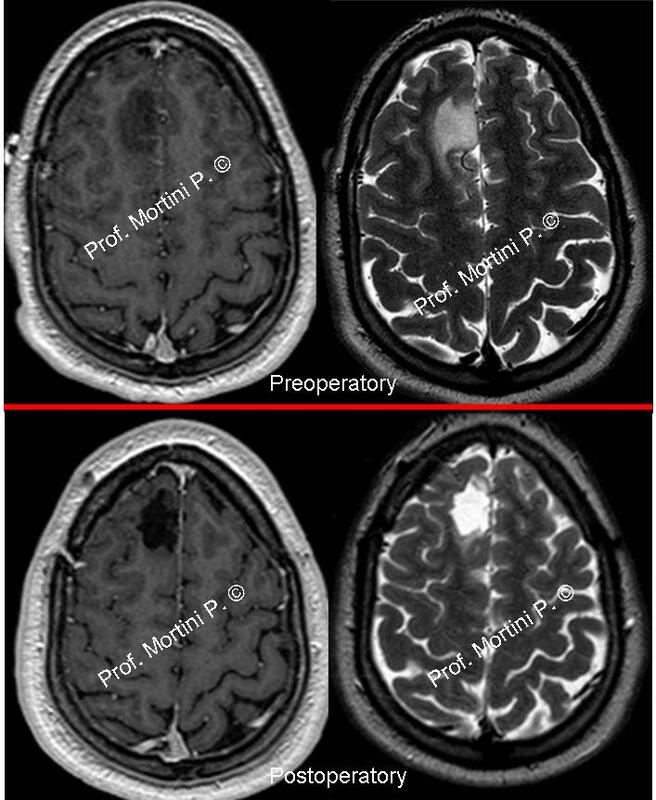 Patients who have received radiation therapy to the head as part of prior treatment for other malignancies are also at an increased risk for new brain tumors. The symptoms of a brain tumor may resemble other conditions or medical problems. Always consult your physician for a diagnosis. • neurological examination – your physician tests reflexes, muscle strength, eye and mouth movement, coordination, and alertness. • computed tomography scan (Also called a CT or CAT scan.) – a diagnostic imaging procedure that uses a combination of x-rays and computer technology to produce cross-sectional images (often called slices), both horizontally and vertically, of the body. A CT scan shows detailed images of any part of the body, including the bones, muscles, fat, and organs. CT scans are more detailed than general x-rays. • magnetic resonance imaging (MRI) – a diagnostic procedure that uses a combination of large magnets, radiofrequencies, and a computer to produce detailed images of organs and structures within the body. • x-ray – a diagnostic test which uses invisible electromagnetic energy beams to produce images of internal tissues, bones, and organs onto film. • bone scan – pictures or x-rays taken of the bone after a dye has been injected that is absorbed by bone tissue. These are used to detect tumors and bone abnormalities. • arteriogram (Also called an angiogram.) – an x-ray of the arteries and veins to detect blockage or narrowing of the vessels. • myelogram – a procedure that uses dye injected into the spinal canal to make the structure clearly visible on x-rays. • spinal tap (Also called a lumbar puncture.) – a special needle is placed into the lower back, into the spinal canal. This is the area around the spinal cord. The pressure in the spinal canal and brain can then be measured. A small amount of cerebral spinal fluid (CSF) can be removed and sent for testing to determine if there is an infection or other problems. CSF is the fluid that bathes the brain and spinal cord. • positron emission tomography (PET) – a type of nuclear medicine procedure. This means that a tiny amount of a radioactive substance, called a radionuclide (radiopharmaceutical or radioactive tracer), is used during the procedure to assist in the examination of the tissue under study. Specifically, PET studies evaluate the metabolism of a particular organ or tissue, so that information about the physiology (functionality) and anatomy (structure) of the organ or tissue is evaluated, as well as its biochemical properties. Thus, PET may detect biochemical changes in an organ or tissue that can identify the onset of a disease process before anatomical changes related to the disease can be seen with other imaging processes such as computed tomography (CT) or magnetic resonance imaging (MRI). • magnetic resonance spectroscopy (MRS) – a procedure that produces images depicting function rather than shape. The equipment requires a special, highly complex facility. Astrocytomas are glial cell tumors that are derived from connective tissue cells called astrocytes. These cells can be found anywhere in the brain or spinal cord. Astrocytomas are the most common type of childhood brain tumor, and the most common type of primary brain tumor in adults. Astrocytomas are classified as I-IV based on the World Health Organization criteria. Grade III/IV tumors are malignant. Grade II tumors, while historically benign have the potential to eventually become malignant. Astrocytomas are further classified for presenting signs, symptoms, treatment, and prognosis, based on the location of the tumor. The most common location of these tumors in children is in the cerebellum, where they are called cerebellar astrocytomas. These persons usually have symptoms of increased intracranial pressure, headache, and vomiting. There can also be problems with walking and coordination, as well as double vision. In adults, astrocytomas are more common in the cerebral hemispheres (cerebrum), where they commonly cause increased intracranial pressure (ICP), seizures, or changes in behavior. Meningiomas are usually benign tumors that come from the meninges or durra, which is the tough outer covering of the brain just under the skull. This type of tumor accounts for about 25 percent of brain tumors. They are slow growing and may exist for years before being detected. 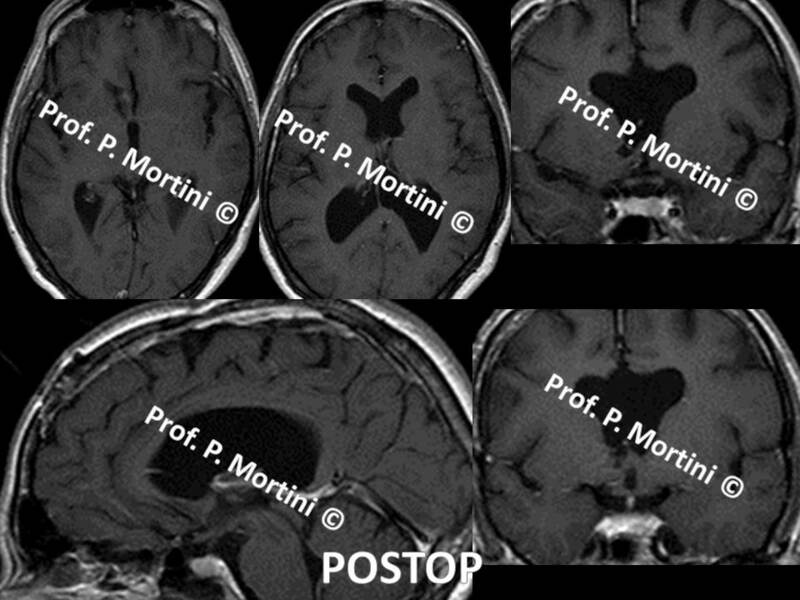 Meningiomas are most common in patients in their 40s and 50s. They are commonly found in the cerebral hemispheres just under the skull. They usually are separate from the brain and can sometimes be removed entirely during surgery. They can, however, recur after surgery and certain types can be malignant. Craniopharyngioma are benign tumors that occur at the base of the brain near the nerves from the eyes to the brain, and the hormone centers. Sixty percent of craniopharyngioma occur in patients older than sixteen years of age. Symptoms include headaches, as well as problems with vision. Hormonal imbalances are common, including poor growth and short stature. Symptoms of increased intracranial pressure may also be seen. Although these tumors are benign, they are hard to remove due to the sensitive brain structures that surround them. Surgery is usually the first step in the treatment of brain tumors. The goal is to remove as much of the tumor as possible while maintaining neurological function. A biopsy is also done to examine the types of cells the tumor is made of for a diagnosis. This is frequently done if the tumor is in an area with sensitive structures around it that may be injured during removal. • This is a tube that is placed into the fluid filled spaces of the brain called ventricles. The other end of the tube is placed into the abdomen to help drain excess fluid that can build up in the brain and cause an increase in pressure in the brain. 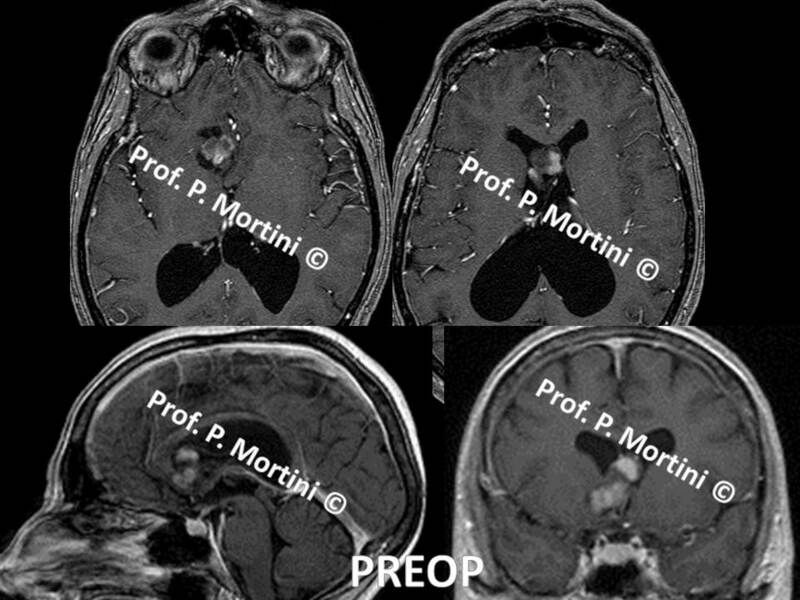 • stereotactic radiosurgery – a new technique that focuses high doses of radiation at the tumor site, while sparing the surrounding normal tissue, with the use of photon beams from a linear accelerator or cobalt x-rays. • gene therapy – a special gene is added to a virus that is injected into the brain tumor. An antivirus drug is then given which kills the cancer cells that have been infected with the altered virus. As with any cancer, prognosis and long-term survival can vary greatly from individual to individual. Prompt medical attention and aggressive therapy are important for the best prognosis. Continuous follow-up care is essential for a person diagnosed with a brain tumor. Side effects of radiation and chemotherapy, as well as second malignancies, can occur in survivors of brain tumors.